Yeah, I know…I’m not doing my NORMAL blog posts. Believe me. I’m keeping articles and some thoughts about culture, books, movies, the Bible, etc. to share with you once another part of this Leukemia journey with Abby has completed. For now, it seems like all that we can do here in Colorado is fight the good fight. Below is TODAY’S blog input from both Mark and Tiffany. As you will see, the physical battle is only ONE part of a bigger story. It gives all of us insight on how illness and struggle affect EVERYTHING in our lives. Life compartmentalization never works. When someone tells you after you ask the question, “how are you doing?” that they are “fine,” be suspicious. There is ALWAYS a larger story. Yes, there may be relational boundaries that you need to honor…but if someone is in your life as a friend, family member or brother or sister in Jesus, please know there is ALWAYS more to the story. The question in most of these case is – are you courageous and patient and loving enough to enter into that story? Give that some thought and prayer! I think the hospital is starting to catch up with us. We’re all pretty exhausted right now. Life still goes on even when you don’t sleep well every third night. Yet, there has been a lot of good lately to report, And, at the same time, a lot hard. But, as you all know it just keeps going. So, we keep on going. I haven’t really wanted to blog lately. Yet, I know that people are also wondering how Abby and the family are doing so let me give you the quick update. The Good, The Bad, and The Ugly or in our case, The Exhausted. Well, let’s start by saying that those baby monocytes are starting to turn into lymphocytes. Abby was at 20 ANC for two days, then her ANC was 40, 50 and today it’s at 90! 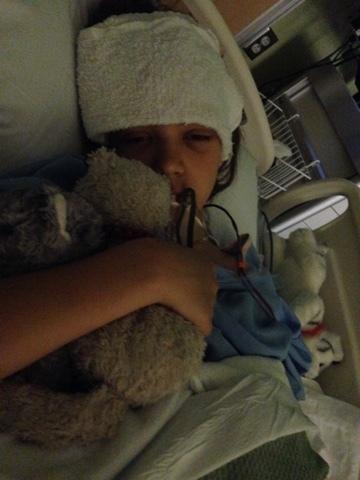 Abby is also getting weened off of the pain pump and is moving over to mostly oral medication. Her mouth sores are almost gone and probably her throat/stomach/gut is the same since the pain has subsided. They are also trying to get her off of the IV nutrition and back on solid food, so they gave her an appetite stimulant. I guess it worked because she ordered eight things off of the menu and ate at least 3 of them. I’m back on duty tonight after a couple of nights back in Fort Collins. Once Abby is at 500 ANC for three days in a row, off of the IV, and is eating, they would be able to discharge her. That could be as soon as a week away! Even when Abby is released we still have to stay close to the hospital until Day +100 to +120… That means she can’t come home until late July/early August. So, we will be moving again… kinda. We now have a 2-bedroom apartment near the hospital in Denver. It’s almost as fast to walk to the hospital as it will be to drive. I wish our house were just a bit closer to Children’s Hospital, so we could all be a family together again. In the midst of all of this, our stuff came on back to our Fort Collins house on Saturday. We haven’t opened up all of the boxes yet. As you can imagine, it’s kinda like opening up a box of memories. It’s nice to have more choices of clothes to wear, and the girls were excited to get their bikes back. Understandably thought, they were also a bit sad. Lily said she missed biking as a family in Japan. Anna had a few hard days too, and I think some of it can be attributed to the arrival of this stuff. With all of that said, I think that not being a family unit has been the most exhausting part of this journey. We have always found strength together as a family. In Japan we biked to school together, played games together, had family nights, talked over spiritual and emotional needs, walked, shopped and sometimes cried together. But now, we are apart. Anna and Lily can’t visit Abby in the hospital because it is still “respiratory season” and they are under 13. I think we all are starting to feel the effects of not being that tight family that we were. I had a little Daddy-Daughter Movie Night last night since I was home by myself with Anna and Lily. At the same time, Tiffany and Abby had a little movie night of their own in the hospital. So, we may be doing the same things but with 75 miles between us it just doesn’t feel the same. We all have had, or will have moments like these in our lives. Ours just happen to be packed into this year. We will be a family together again soon. And we will be tighter as a family because of our times together, and because of this time a part. You only know what you miss when it’s gone. So it is looking like Abby will be discharged sometime next week. We are blown away! Her monocytes are continuing to increase. Her ANC is 90 today. Once it reaches 500 and stays there or goes higher for three consecutive days, she is able to leave the hospital. In preparation for that we are working on getting her meds to oral, instead of IV. That is a slow process as some of them don’t sit well in her stomach. On the stomach note, she also has to be eating. That is slowly happening. After two weeks of mucositis, radiation, and chemo her stomach is on strike I think. She has been getting IV nutrition for the past 2 weeks, so it’s a matter of stimulating her appetite, having her try some things even though they don’t taste like much right now, and then having her stomach keep it down. She is being weened off of her pain meds as well. If all of that can come together and she doesn’t get any infections she will be out of here! We will be behind the hospital in the apartment since we will be checking in a few times a week at the clinic. At around day 30 she will have another bone marrow test to see if the new cells are Anna’s or hers. Obviously, we hope they are all Anna’s. If they aren’t, they have steps they can take to encourage Anna’s cells to take over and Abby’s to give in. Mark and Abby and I will attend a discharge class Wednesday to learn all the “rules” of caring for Abby once she leaves the hyper-clean hospital environment. We’ve taken the class to learn how to take care of her central line so we can check that off the list. I think there is also a meeting with the pharmacy to go over all the meds she will be on. Oh, and we have a day in the hospital where we have to be in charge of all of Abby’s cares. Mouth, nose, meds, bath, central line…. to make sure we are able to care for her. It’s funny, I was thinking they should have done that with us when she was born before we got to take her home from the hospital! Of course, if that were true none of us would have been able to go home with our kids! Anna continues to get back to normal- at least physically anyway. The life of an adolescent in the throws of cancer is nothing close to normal. Lily is doing well, lots of energy and keeping us all laughing (or tearing our hair out, which for some of us threatens what little hair we have….not naming any names). Anna and Lily are home doing school right now. Mark is getting some work done at a coffee shop close by. My folks took a much needed break for a couple days and are staying in the apartment here in Denver re-cooping. Abby is playing with some Lego Elves kits she got and is feeling really well today. As always, we appreciate your prayers and support of us as we walk it out. It seems like we have come up the down side of the BMT and are now on a solid road to healthy. It feels good. I love this pic of Abby! For obvious reasons! This is the girl who smiles, who loves simple things…who gets excited about handling spiders and collecting owls…a girl who is just as much at home with dragon television shows/movies as she is with My Little Ponies. Abby has a delightful innocence to her spirit, an inquisitive heart and focused mind. What been amazing to me (this is Robin, the “Papa” writing) is to hear of the steadfastness and incredible mature manner that Abby is displaying for all the hospital staff as well as our family/friends to see. I don’t get a chance to see her often because I’m on “home duty” with her sisters, Lily and Anna. Even so, I hear the stories as well as see for myself when I get a quick Facetime glimpse of Abby “in battle” mode. I remember when she was three and I wrote often in her blog about the amazement and awe that we, her family, felt as we watched a young girl fight the cancer demon. Now, the story is the same…from the stories I hear from her mom, dad and “Nana” (Vicky), Abby is focused, heroic, and proving once again that she is able to handle and work through whatever this Leukemia treatment is dishing out. For those of us who look for inspiring moments and people around us to emulate and from which to gain strength and perspective in our lives, I have no further to look than my eldest granddaughter. She has more bravery than I would have in the same situation. She rarely suffers publically…she bears all things at the same time that she joins us in believing all the promises of God for His overwhelming presence in the darkest of our despair. As I mentioned above, I’m not on the hospital front lines. Even so, I daily get an earful of information from Mark, Tiffany and Vicky. As each of them make their way to and from the hospital for their 36-hour shifts, each comes home not just exhausted but completely amazed…amazed at how this young lady is navigating trying days. I think of Abby and then I think of the shallowness of much of our culture, the people who are held up as “role models,” from Pop Stars who are doted over to athletes who revel in the public’s adulation. It would be interesting to get everyone in the world to take a trip through the Seventh Floor at Children’s Hospital in Aurora, Colorado. THERE is the place where real heroics are being experienced day in and day out. There is the place where people should be standing up and taking notice of children of all ages facing down not critics of their superficial music or complainers of the unfairness of a sport in which millions of dollars are made…no, these children display the real heroics. They withstand the suffering that few adults I know would handle with grace and acceptance. I watch Abby and hear the stories day by day…it is the same in almost every room of the seventh floor…heroic persistence, focused hope, and enduring faith. This pic of Abby says what I can’t say in words…a smile and a cuddle with another one of the seemingly millions of stuffed animals (especially owls) that adorn her room. This is the girl who is running the race and keeping the faith. We are in awe…we are in prayer…we will be the first to cheer as she crosses the finish line into health. More to come in the coming days! Well, this is the “Papa,” aka Robin Dugall. Mark has added me to the contributors list for obvious reasons: sometimes the guy is beat! He wants to do a blog post, but his fingers and brain are on a small but highly needed vacation! Seriously, I’m blessed and honored to be able to share with our extended family of friends. I simply pray that I can do the summaries justice. Mucositis is the painful inflammation and ulceration of the mucous membranes lining the digestive tract, usually as an adverse effect of chemotherapy and radiotherapy treatment for cancer. Mucositis can occur anywhere along the gastrointestinal (GI) tract, but oral mucositis refers to the particular inflammation and ulceration that occurs in the mouth. Oral mucositis is a common and often debilitating complication of cancer treatment. As you can imagine, the sores (that at this point are occurring in Abby’s mouth and in her lower GI tract, are painful. This “window” of potentiality in terms of this side effect will go on for at least the rest of this week. The biggest issue is that she has no “fighters” within her blood. After the transplant, her body is attempting to accept the new stem cells. It is not yet at the point where it is producing the necessary white blood cells and antibodies that can do “battle” against mucositis or other “invasions.” She still needs to be in a very protective environment. NOBODY can expose her in any way to something even as minor as a common cold. So, essentially, she is on medical lockdown. For me, I watch my wife (the Nana) Vicky and Mark and Tiffany making their way to Denver (a roughly 65 mile trip) daily in rotation. Most days there is ONE person needed at the hospital to do mouth sore care, help Abby try to get a small walk in (if possible), bathe, and attempt to get her to eat and drink (if she can stomach anything at this point). One of them spends the night at the hospital and then gets “relieved” after a two-day, one-night rotation. As you can imagine, there is much to be aware of when having the on duty hospital care time. I watch all three of them in the rotation and I’m amazed and blessed. They can’t sleep at the hospital amidst the beeping, buzzing and medical team vital checks. Even so, there are small celebrations that we have daily. For example, we cheered here in Ft. Collins last night when Tiffany (who was on duty) shared with us that Abby had a bite of BBQ pork rib. Vicky was with her earlier and was celebrating her eating a small amount of mashed potatoes. Another big concern at this stage is her calorie and fluid intake. So we keep praying that she can eat and drink even small amounts so that the medical team does not have to resort to other means of keeping her nutrition “up” (primarily, feeding tubes). At this point, remember, she has NO immune system. The prayer is that by day +28 she will produce three consecutive days of ANC levels (white blood cell counts) over 500 (normally that number is in the 1000’s). But let me tell you what I hear, “Abby is such a trooper, she is strong, focused and incredibly brave to keep facing these days with confidence.” Not only that but Mark and I estimated that at any given moment 100’s of people from around the globe are praying for her. We have people praying in Japan, Romania, Poland, Hungary, the UK…Canada, Mexico, South Africa, New Zealand, all over the USA. It is amazing and such an encouragement. As I mentioned in https://spiritualregurgitations.com/ (which is MY blog) we have as a family such HUGE THANKFILLED HEARTS for the outpouring of love, incredible gifts, and more support than we can dream of! That’s it for now…more to come as the days go by! At least for a few days, I’m going to repost my son-in-law’s posts regarding our granddaughter’s battle with Leukemia. I’m doing it for prayer, information for you as well as giving a “testimony” to the faithfulness of my family as they walk through this valley! So, here’s today’s update! God bless each of you who are taking this journey with us in prayer and support! We’re exhausted and it’s only day 1. Actually they call it Day +1, transplant day being day zero… only 99 more to go to get to Day +100. That seems a bit discouraging so I’ll just look at this week. Abby’s having a rough this afternoon. Threw up and that really hurt all of her sores in her gut. She is on the PCN (Pain pump) so we were helping her be ok with pressing the button when things hurt. She can be such a trooper that sometimes she just grunts through it, but she won’t be grunting through this. But that is her personality. She just does what has to be done. The day after her bone marrow test in Japan, she biked to school. I have a video of her biking up this little hill over the 6-lane and only 16 hours earlier she was under getting the bone marrow test. When she was in 6th grade she did cross country. After her first meet, we took her to the doctor and they said she had a sinus infection and ear ache. She had run her race the day before. She is tougher and more tenacious than I ever could wish to be. Not because she likes to be, but because that’s just her life. So, these next few weeks will be another example of this tenacity. No one wants her to have to hunker down but she will. And, with the help of the pain pump, hopefully she will make it through a bit more comfortably. Either way, it’s gonna be a rough go. Still more effects of chemo and radiation to come. We’ll probably see the chemo effect next weekend through the middle of next week. But, the glimmer of hope in this painful time is that she has Anna’s cells now. The rescue is underway. As Abby’s cells continue to die off, Annas will get stronger and then finally the transfer (the coup d’é·tat really) will be complete. Anna’s home. She was a rock star! She’s sore but in bed. Tiffany and I will be hitting the pillow soon too, it was a tiring night in the hospital for both of us. Vicky is taking care of Abby tonight and they are staying on top of the pain and nausea. Thanks for all of the comments and prayers. Abby and Anna both loved to hear from all of you all over this globe! Thanks again for everything! Today, by the powers and authority given to me as the Dad, I hearby declare the blog name today will be called ‘Anna Update’ in honor of her bravery and gift. Today Anna did the heavy lifting. She’s out of surgery now and recovering form anesthesia. She was in there for about 3 hours. They has to take a bit more than the max that she can give because her stem cells weren’t as densely packed as is typical. They ended up taking it from 5 sites. 2 in the back hip left side one in the back right and 1 from each side on both front hips. She’s gonna be sore for a bit. The lab is spinning down the marrow and getting the stem cell separated. Right now, based on calculations, they are still below the amount they would like to have for transplant. But they couldn’t take any more volume so it is what it is right now. If they needed they could always try to harvest more via peripheral blood but we’ll talk about that with the doctor later once we know the final stem cell volume. She’s a trooper. We’re all tired and are just trying to roll with it. Abby’s pains mostly under control for now, she’s on a pain pump. The thing that really hurts is when she hiccups which unfortunately happens a lot right now. Later today she’ll get an IV drip of Anna’s Stem Cells where they will make a new home in Abby. If you test Abby’s blood in a year, she’ll have Anna’s DNA. But if you cheek swab her, she’ll still be Abby. I told her that she may have a future as a criminal mastermind. But, she didn’t think that would be the best use of this gift. I agree as well. Let’s just get her better. I know you may be looking at the title of this post and wondering…yes, tomorrow is the day of our 14-year-old granddaughter’s (Abby) Bone Marrow Transplant. On the surface, that would be in most estimations FAR from being a gift. What IS the gift is you…if you are reading this it is MOST LIKELY that you are part of my life in some way, shape or form. Maybe you have been in one of my courses, or a faith community in which I was a pastor/leader…maybe you heard me speak at a conference or were part of the Youth Leadership Institute family at Azusa Pacific. Maybe you are a colleague and fellow Professor, who trains, equips and teaches an emerging generation. Maybe you are friend outside of any of those definitions…someone living across the USA or Europe or Asia. Whatever and wherever you are, YOU ARE A GIFT. Your prayers, support, encouragement, texts, emails, gifts, each of them is a HUGE blessing to our family and Abby. Let me give you an example of how much of a gift all of you are…the other day Abby shared with her family that she had a favorite song, “It’s not over yet” recorded by the group, King and Country. After thinking about it and listening to the song it dawned on me that one of my “kids” (Janie Moore) was friends with the group. I contacted Janie; she contacted the band, and when they finished their concert that evening, the leader of the band recorded a greeting of love, prayer and encouragement to Abby. It’s on Facebook…check it out! Each of you has done the same or much, much more over the months of this battle. That’s why we can say this time is a gift…it is a Kingdom gift of you sharing our life’s journey with Abby as part of our family…it is a gift to know that you are praying and lifting Abby’s healing up to the Lord. So, keep in touch. Abby’s blog will keep everyone posted on how the process is going. Oh, I can’t forget this, many of you contributed financially to Abby’s “gofundme” page…wow! That is a HUGE blessing as well…something that we are so thankful for in so many ways. So as we embark this week on a scary journey, we know that YOU are walking with us. Jesus is close beside Abby, and all of us as a family, and prayer is LIFTING us up turning fear into confidence, sorrow into dancing, loneliness into friendship, uncertainty into assured promises. It is NOT trite to say this because it is true and comes from the bottom of my heart – THANK YOU AND GOD BLESS YOU RICHLY. Friends, I do not take my responsibilities as a teacher, spiritual leader or familial patriarch lightly. I feel the need to be wrestling with the short term as well as long term implications of culture and societal transformation. Lately, I have taken notice of two factors that I want to quickly highlight (and then give you an opportunity to read, discover and deliberate on your own). I have a hard time saying, “thus saith the Lord” when it comes to these issues because I feel strongly that I do not speak for God. Even so, I know and have experienced enough of theistic truth and embraced a decidedly theocentric worldview for a reason…I believe in the veracity as well as the “rightness” of the Christian story. In other words, he is alerting those of us who DO embrace a faith system that we believe not only informs but acts as a “map” to a God-honoring and pleasing lifestyle, that pressures are rising so dramatically within our culture TO CRUSH and silence any other voices but those who promote a untethered value system. You see, the ONLY choice that an individual has when it comes to morality and ethical choice outside of a faith system and communal experience of faith is that of radical individualism, altruistic humanism, or “group think.” The way “group think” changes culture at large is by mass “shaming” and threat. That is what Rod is writing about and I do believe it is worth your time to reflect on his article (as well as follow his links to other articles that expand on his perspective and observations). “…it takes religious values to shape a moral frame of reference. The enlightenment focused relentlessly on two entities – the individual, detached from historical context and the universal, politically realized in the secular state. Neither the individual NOR the state is where we discover who we are and why. The world that has emerged is that of individuals as the makers of their own meanings and the state as the perceived moral arbitrator between conflicting interests. In this environment, personal autonomy reigns supreme. Without community and tradition, there is no self-expression beyond the inarticulate cry of a child. Individualism condemns us to the task of constructing our own morality and becomes inherently private and detached from relationships. That’s why we can have SO much “immorality” within communities of faith. The gradual transformation by which sin becomes immorality, immorality becomes deviance, deviance becomes choice, and all choice becomes legitimate, is a profound redrawing of our moral landscapes and alters the way we see the alternatives available to us in life. The stresses of culture without shared meanings are already mounting and we have yet to count the human costs. The move from a morality of self-imposed restraint to one in which we increasingly relay on law to protect us from ourselves leads to a society that inherently rewards lawlessness. In a vocabulary of a consumer culture, we speak only of rights and entitlements, interests and choices, self-expression and success. We inhabit a culture in which religious teachings are marginal to many people’s moral choices. Our moral language has been effectively secularized. The orthodoxies of our time are that morality is a private affair, a matter of personal choice, and that the state must be morally neutral. Our moral imagination is bound by three central themes – autonomy, equality and rights. The central character of our moral drama is no longer the saint or the hero, but the free self, unencumbered by attachments, unobligated by circumstance, freely negotiating its temporary contracts with others. We no longer know what it is to identify a moral issue, as something distinct from personal preferences on the one hand or technique on the other. We have arrived at Nietzsche’s conviction that morality is no more than a camouflaged way of imposing our will on others. If there is no God, than all is permitted. Our loss of a shared morality has fragmented our social world and even made our most intimate of relationships seem fragile and conditional. In other words, we cannot edit God out of our language and leave our social world unchanged. I could go on and on about this and its impact on our society (especially our faith communities). As I said, I’ll encourage you to draw your own conclusions. Dreher’s work is a call to attentiveness. By all means, I have not nor will I ever turn off the volume in contemplating and acting on what he commends to our attention. Our faith communities have “rights” in our country to be able to live without having to bow at the altar of cultural breezes and altars. Morality and ethics within the framework of faith and community are near and dear to our faith traditions. Dreher is telling us that the days are arriving where the cost is going to get higher and higher to stand within those boundaries (personally and corporately). It merits our close observance.